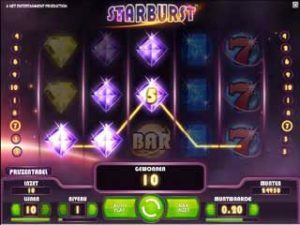 The Starburst slot machine was developed by Netent and available in the online casino and mobile casino of Oranje Casino. In the mobile casino there is Starburst Touch, but for both versions the rules are the same. There are a total of five reels and three available in the game with a total of ten paylines. The theoretical payment percentage is 96.1 percent. Extra chances of winning are offered when playing this game, as the winning combinations count not only from left to right in this game, but also vice versa. That is the most striking game element of the Starburst slot machine. The maximum number of coins that can be won in a game round is 50,000 coins. The symbols on the reels are for the most part formed by star symbols that resemble glittering diamonds. The symbols are supplemented with a number of other images, such as the seven symbol and the bar symbol. The diamond stars are visible on the reels in various shapes and in different colors. As stated, a winning combination can fall on the reels from left to right and from right to left. That means that with every spin an extra chance of winning is offered compared to other slots, with the winning combinations counting only from left to right. The value differs per symbol. For example, the bar symbols in a winning combination yield the most and this symbol is followed by the seven symbol. The diamond stars also vary in value and their value can be seen in the pay table that is available with the game. The Starburst slot machine features wild symbols that appear exclusively on reels two, three and four. If a star symbol is visible, it will fully unfold over the role. In addition, a re-spin is given if there is a wild roll, with the wild symbols remaining. Up to three re-spins can be obtained and a re-spin is only given if there is a winning combination. The coin value and bet level are at a default setting when the Starburst game is opened. However, the player can always use the opportunity to adjust the bet level or coin value. Of course it is also possible to change both the coin value and the bet level. In principle, that can be changed after every game turn. The stake in money varies per chosen bet level and coin value. For example, if a player chooses to play with a coin value of 0.01 euros on ten paylines and with bet level one, a spin costs 0.10 euros. If the bet level is set to ten and the coin value to 1 euro, a spin costs 100 euros each time. Naturally, all kinds of variations are possible and, for example, a coin value of 0.50 euros can also be played at betting level four. If desired, the player can change even more settings, such as setting a quick spin, whereby the reels spin faster.